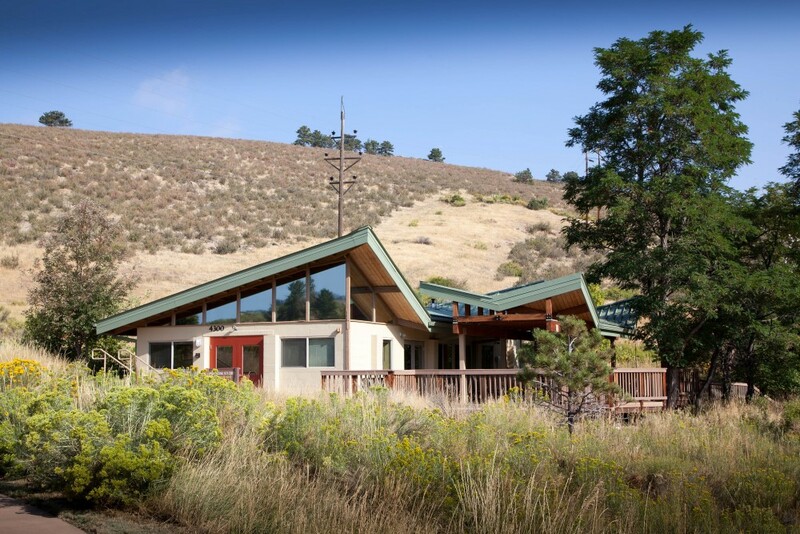 You can host your next meeting, retreat or class at Primrose Studio at Reservoir Ridge Natural Area, a unique space that is available for rent by the public for gatherings. Primrose Studio is a quiet, beautiful spot with a full kitchen, spacious patio, and comfortable seating for your next gathering of up to 36 people. In 2001, the late Rob and Dorothy Udall, advocates for conservation and social work donated Primrose Studio and surrounding land to the Fort Collins Natural Areas Department. The land and studio are now part of Reservoir Ridge Natural Area. It was the Udall's wish that the land be conserved and that the studio be available for groups to use. That wish came true in 2007 with the opening of Primrose Studio. The studio's unique design is inspired by the spectacular setting and Dorothy Udall's art, some of which is displayed at Primrose Studio. Artist Barb McKee of Surface Strategies, Inc painted images of native grasses from Dorothy's compositions on the face of several doors and cabinets as part of the City's Art in Public Places program. Reservations, set up and equipment are easy. Our staff will help you reserve the space, arrange the room, and provide on-site assistance the day of your event. We provide easels, white board, markers, screen and internet access at no extra charge. A full kitchen is at your service with a stove, oven, microwave, refrigerator, coffee maker, and dishware for 30 people. Only non-alcholic beverages are permitted. Claymore Lake is privately- owned and there is no access to the shore or water. All guests must remain on trail. Primrose Studio is accessible with one designated handicap parking space, paved access from the parking lot to the front doors (doors are not automatic) as well as accessible interior, bathrooms and outdoor deck. Please respect our neighbors and be safe by observing the speed limit on Michaud Lane and Overland Trail Rd. The administrative fee is $200 for up to 5 hours and $40 per additional hour. For government agencies, schools and other non-profit organizations the fee is $100 for up to 5 hours and $20 per additional hour. Primrose Studio is available Tuesday through Saturday from 8 a.m. – 10 p.m. Primrose Studio is closed on Sundays and Mondays and these official holidays: New Year’s Day, Memorial Day, Independence Day, Labor Day, Veteran’s Day, Thanksgiving Day, and Christmas Day. A large countertop along the west wall may be used for buffet service. Please call or e-mail the City of Fort Collins Natural Areas Department at 970-416-2815 or PGFjbGFzcz0=">bmF0dXJhbGFyZWFzQGZjZ292LmNvbQ== with your requested date, time, type of event, number of people attending and desired room configuration. We will then be in contact with you about the availability of your requested time. If available, you will need to fill out a license agreement which will be e-mailed to you and pay the administrative fee to secure your desired date and time. Reservations are not confirmed nor the dates and times held until both the completed license agreement and payment of the administrative fee is received by the Natural Areas Department. How early can I reserve Primrose Studio? Non-City groups may make reservations up to three (3) months in advance. City groups may reserve Primrose Studio up to twelve (12) months in advance. 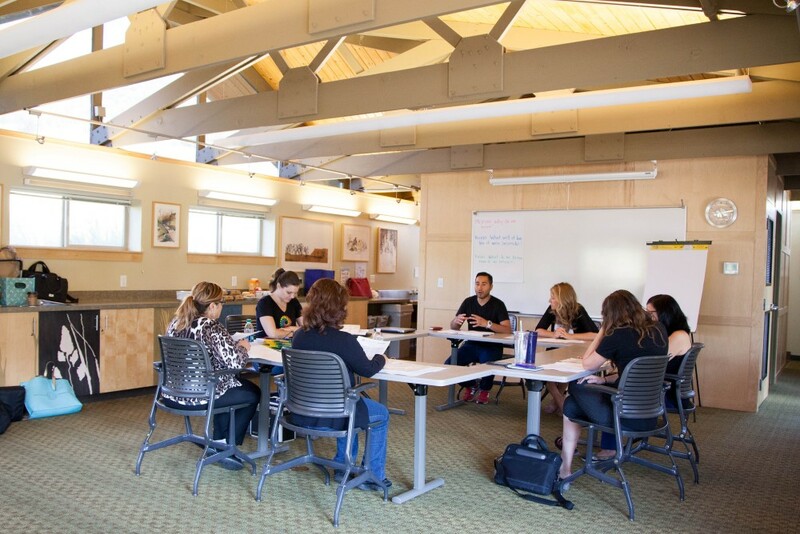 Environmental education programs, meetings and activities may also reserve the studio up to twelve (12) months in advance. How far in advance must Primrose Studio be reserved? The completed license agreement and payment of the administrative fee must be received by the Natural Areas Department no later than fourteen (14) days before the beginning of the reserved term. The administrative fee may be paid via check, Discover, Visa or MasterCard. Checks may be mailed or dropped off at our office at 1745 Hoffman Mill Road, Monday – Friday 8 a.m. – 5 p.m. A credit card number may be given over the phone or brought in to the office. Since Primrose Studio is a popular venue using the most expedient method available to you ensures your desired date and time is still available. If I need to cancel my reservation will I get a refund? If you cancel with 30 days or more notice you will get a full refund of the administrative fee. Notices of cancellation less than 30 days in advance will not receive a refund. My event is not an event for profit. Can I get the non-profit rate on the administrative fee? To qualify for the non-profit rate you must be a 501(c3) designated non-profit organization, school or government organization. 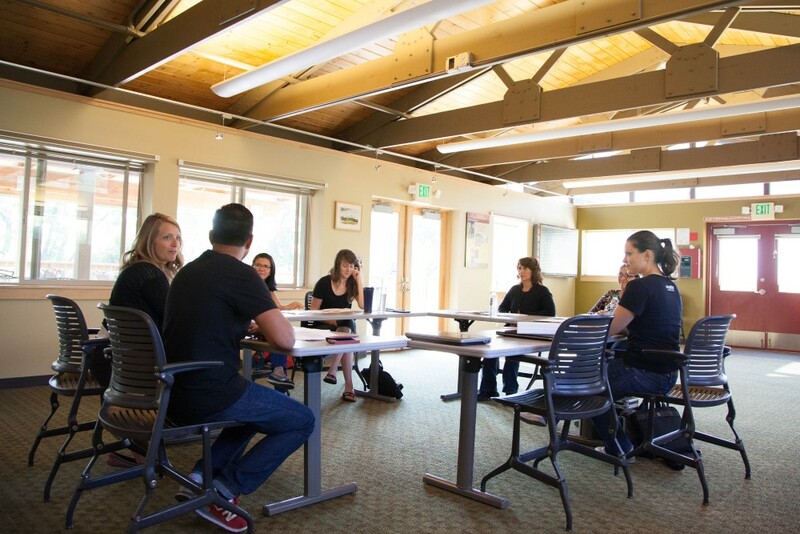 Primrose Studio is a popular destination for company retreats and meetings. Workshops and classes on a wide variety of topics have been held there. It is also a great location for special events such as small weddings, anniversary parties, showers, family gatherings and more. 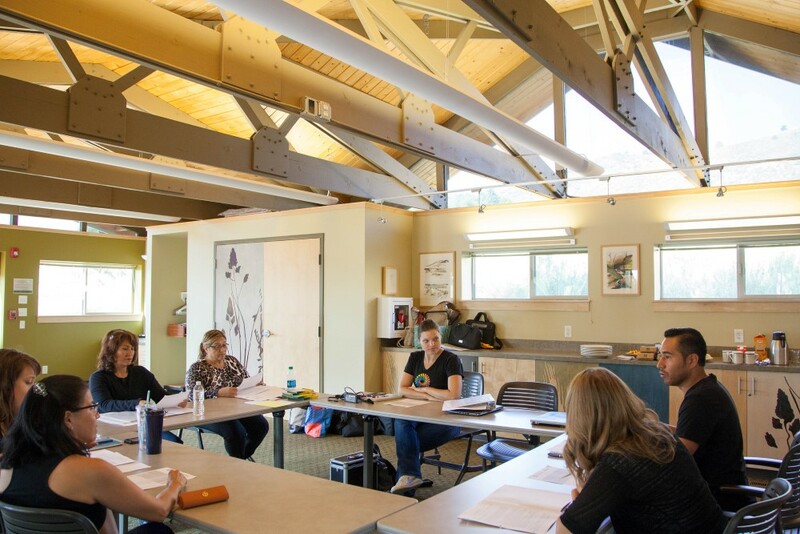 What is considered an environmental education program, meeting or activity? Environmental education means teaching and learning about the natural environment, its effects on humans, and impacts of humans on the environment. This includes conservation and sustainability of all natural resources. The goal of environmental education is to increase knowledge and awareness about the environment and to promote stewardship of natural resources. Can Primrose Studio accommodate artist groups? *Yes, though pottery/clay classes are not allowed. Depending upon the type of artistic group the facility may have protection for the floor and tables in place upon your arrival. If these protective measures are not left in place and damage is sustained you will be held liable. **It is also your responsibility to protect our chairs, countertops, windowsills, walls and deck. If you plan to create on the deck, please provide your own heavy duty tarps and painters blue masking tape. ***Cleanup of paints and other toxic supplies must be done in the large sink along the west wall. Please do not clean brushes in the bathroom or kitchen sinks. Can we sell our art at Primrose Studio? The facility may not be used for promotions, sales or other commercial activities. No money should exchange hands on the premises. May we charge participants for classes, activities or events held at Primrose Studio? Yes however, no money should exchange hands on the premises. Can I hold a political fundraiser or rally at Primrose Studio? Per the Use Policy, Primrose Studio may not be used to influence a ballot measure or promote or oppose a candidate for political office. You may set up an appointment to view Primrose Studio with the facility attendant, Tim Labaw. He can be reached at 970-219-2158 by phone or at PGFjbGFzcz0=">dGxhYmF3QGZjZ292LmNvbQ== . Primrose Studio is at 4300 Michaud Lane, Fort Collins, CO 80521. Please obey posted speed limits even if you’re late! When you reserve Primrose Studio, both gates at the Reservoir Ridge Natural Area parking lot will be opened at the start time on your contract. You may occupy Primrose Studio at the start time on your contract. The facility attendant will meet the group and provide a short orientation at the start time on your contract. The parking lot accommodates 15 cars, you may not exceed this capacity. We strongly encourage you to ask your guests to carpool. There is also a bike rack at Primrose. Only park in designated spaces so emergency vehicles can safely access Primrose Studio if required. The facility attendant will be there at the conclusion of your reserved time to secure the facility after your departure. Most comfortably, Primrose Studio accommodates 30 people in any configuration. There are tables and seating available for up to 36 guests in a classroom or cluster configuration. No outside seating may be brought into the studio. The floor space in Primrose Studio measures approximately 20 x 30 feet. How can the space be configured? Can we rearrange the room into a different configuration? The facility attendant will set up the room to your specifications prior to your event. You may rearrange the room if desired. It is recommended that you let the facility attendant know so you can be instructed in how to work the tables and chairs without injury or damage to the premises. You are responsible for any damage. When rearranging the room you must maintain a fire escape egress to doors and may not block access to any exits. The facility attendant must have the contact information of a person who will be supervising the group at Primrose Studio for the times of your reservation. The facility attendant will also leave his/ her contact information for the group in case you need assistance. Candles must be in sturdy holders with the flame fully contained. You may serve food and non-alcoholic beverages at the studio. There is a full kitchen with full service for 36 guests. When contacting a caterer let them know you have access to non-disposable dishes and ask them reduce their use of disposable items. Choosing caterers and food providers that minimize packaging and using the provided dishes and serving ware instead of disposables makes a big difference in our trash output. Can we leave behind our unused disposable plates and napkins or food leftovers? No. Primrose Studio is limited in storage space and cannot accommodate unused disposables or leftover food. Can we bring in a small kitchen appliance that is not provided such as a waffle iron, or indoor grill? Yes, you may bring in small kitchen appliances. Any preparation of food using an appliance not provided must be performed beneath or near the exhaust hood of the kitchen’s stovetop. Can we grill or barbeque at Primrose Studio? You may grill in accordance with any current city, county or state fire restrictions. The fire must be contained in an approved appliance located in the graveled portion of the parking lot only. Alcoholic beverages are not allowed at Primrose Studio as per City of Fort Collins ordinances. Smoking is prohibited in all City owned or operated facilities and their grounds, and all City Parks, trails, and natural areas. This includes the prohibition of all cannabis products. No pets are allowed at Primrose Studio. Please inform the City of Fort Collins Natural Areas Department if you need to bring your Assistance/Service Dog. All guests must remain on the trails and roadways. There is a handicap accessible trail (packed crushed gravel) from the deck leading to a bench with a scenic view of Claymore Lake. This area is not to be used for events or ceremonies. Claymore Lake is privately owned and there is no public access to the shore or water. Is there a trail connection between Primrose Studio and Reservoir Ridge Natural Area or the Foothills Trail? No. Access to Reservoir Ridge Natural Area is only available from the trailhead parking lot at the west end of Michaud Lane, or the Centennial Drive trailhead. To connect Primrose Studio and Reservoir Ridge Natural Area, use the road between the Michaud Lane trailhead and Primrose Studio. For your safety and to protect wildlife and plants, off-trail travel is not allowed. Can we set up recreational equipment like a volleyball net, croquet set or bocce ball in the area around the studio? For your safety and that of the wildlife and plants, the area surrounding Primrose Studio is closed to off-trail use. You may not set up any recreation equipment. Please keep all doors closed during your event to keep bugs outside. If you need natural ventilation the windows are equipped with screens. It is also recommended that you bring a Deet-based or its equivalent for mosquito repellant. Citronella candles are not permitted. 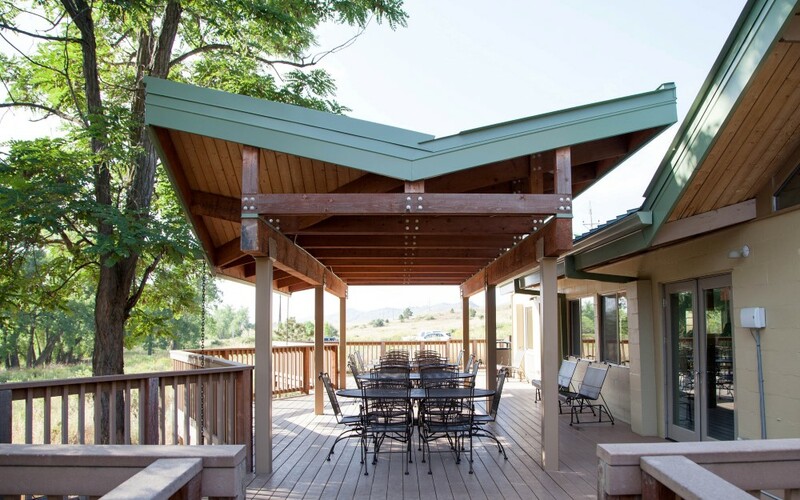 Primrose Studio, its deck and restrooms are all handicap accessible. There is also a ramp to the packed gravel accessible trail leading to an overlook of Claymore Lake. There is one handicap parking space.